Panel 003-A: How Can We Build a Culture of Empathy? Panelists: Check the links for more about each of the panelists, as well as, to see individual interviews. Because mirror neurons re-create for us the distress we see on the screen. We have empathy for the fictional characters - we know how they feel - because we literally experience the same feelings ourselves. If we use the body data, and our body knowledge, and our body wisdom to increase that connection, to increase that empathy, decrease the violence, we can have world peace.... So please join me, become an Empathy Ambassador too. We propose that a targeted and structured explication of empathy is a useful, if not essential, foundation for social work theory and practice. We outline a social work framework for empathy, one that is rooted in an interdisciplinary context, emphasizes recent findings in the field of social cognitive neuroscience, and yet is embedded in a social work context..., students can learn to use their knowledge, values, and skills, informed by empathy, to take empathic action consciously. 00:00 Introduction of group members. Have been Rediscovering Empathy through the lens of the social cognitive neuron science that has come out in the last ten years (including Marco’s). 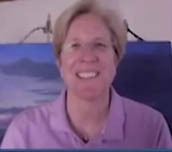 Rhonda - a performing artist, consultant and coach, TED talker and Empathy ambassador. Main passion is improvisation and using improvisation to help people knowing who they are and what to wish from their lives and how to go get it. 02: 45 How do we raise the level of empathy within society? - The importance of dialogue as a first step (Edwin). - The importance of starting talking about empathy at an early age in life. - Infant mental health and the mother - child relationship. - The importance of talking about good things that happens in the world. - Spreading the word person by person, sources online. - The ripple effect of empathy through dialogue (Rhonda). - The pivotal role of the science of empathy - being able to present how it works thus arming us with the tools (Edwin). - Main motivation with scientifically studies of empathy is being able to reach out to the public. - Research shows the human intrinsic disposition for empathy – it is in our nature. - Through various talking points and other channels we can articulate the importance of empathy and putting it back into the public discourse. - Empathy is something interdisciplinary thus forces you to go outside your own comfort zone. - Empathy is not only about neurons and science. It is also about performing arts and about opening up your mind (Marco). 10:05 Sterotype of empathy as a female trait. - Lack of respect for empathy as a kind of sexism, belittling and relegating it to soft values that do not really matter. - The importance of men talking about empathy. - The strong impact of science to engage people for empathy (Rhonda). - Empathy in terms of masculinity. Example of mammoth hunters needing empathy to work in teams and read each other’s emotions for a successful outcome. Maybe this is something that resonates with men (Edwin). - Neurosciences suggest that women tend to be more empathic than men. But it is a matter of degree – not that women are empathic and men are not. - The importance of empathy for a rich life. - Doing things, such as moving and crying, from an acting point of view to get them to experience the mirror neurons. - . Asking questions such as: what went on in your body when I was crying? To some extent you felt what I felt. - The physicality of empathy: Empathy is also in our bodies, not only in our cognitive abilities (Rhonda). - Physicality is a good and fast way to opening that door to understand what empathy is. - Empathy development through bringing performing art into the social work in order to understand other people (Karen). - One of its tenets that it is built on is body data, body knowledge and body wisdom. - Body data being the information that comes in to your body at any moment (hunger, fatigue etc). - Body knowledge is when you add up all that body data over time. A good example is your sleeping habits – if you sleep on your side, on your back, hard or soft pillow etc. People will be able to talk about this for five minutes. - The understanding about your body data is your body knowledge. - The body wisdom brings in the empathy aspect and it is using your body knowledge to make the world work better for you or other people. For instance understanding your body language and its impact, and being able to change. - Understanding your body wisdom to make the world better. - The brain uses all those really subtle body language skills cues to establish a level of connection of the relationship that you are having. - We tend to focus on the linguistic level, thoughts through words, but even as we talk those subtle cues sometimes can completely disrupt a conversation. - The body as an important tool for conveying information and establishing a basic level of empathy (Marco). 20:15 Panel group mirroring exercise. How does it feel? Do we feel more connected now? 21:07 Impact of technology when connecting with others. - We can interact through Skype, email, twitter and connect even though we are far away, thus taking away the magical element of face-to-face interaction. This is compellingly important. - To ask what happens with our brains and what happens when we take students out of the classroom – this is a really different way of looking at it and the importance of being in the classroom. - Because it is more convenient to stay in your house and communicate through technology, people will stay home and do it online. This is going to be a big loss for learning and for the education community. - A large part of learning is about mirroring the person that you are learning from. Art student studying the great masters are mirroring their work. 25:00 How do change the social structure so it maximizes empathy? - Going back to that earlier question on how much is in our bodies and how much is in our brains. Being on screen like this it really curtails the amount of experimental learning that you can do where you get to involve your whole body and being in something versus this: ok, I am going to focus here. - In an online conference when people cannot see us and when people are saying something not so important to us, there is always a temptation to do other things meanwhile, such as checking e-mails etc. (Rhonda). 27:00 Question for RM. Mirror neurons and performing arts – what is your perspective on this? - RM came to the performing art late in life with lots of bodily information and experiences and felt just like coming home like coming home since it was the experience of going into character or expressing something with just body and not voice. - This experience gave a fabulous outlet for discharging all of the information that body has been gathering what it is to be human. - Improvised stories are not my story and I am able to put myself in that person’s situation because that I have the ability to see or experience other people to have that vicarious experience. This makes you a lover of humanity and a feeling of being fortunate for being an empathetic person (Rhonda). - Using imagination and life experiences to interact with others. - Reading a lot of books shaped all the stories in my body, just by reading (Rhonda). - Literature and narratives are so important. As a scientist I think that science and rationality are important too, but humanities are also so important for our mental lives. - The world became more empathic when writing and distribution of novels began (Rhonda). 35:25 Where does each of you find most empathy in your lives? Most intense moments of empathy? 37:10 Does science support that we have more empathy for people that are most like us or that we are closest to? What about feeling empathy for injustice and identifying with oppressed and discriminated people? Does this come natural to people? How do you reconcile those two sides, when science suggests that we identify and empathize with people who most are like us? - Two dimensions to this. - 1) Individual difference level. Some people tend to be more empathic than others. - 2) Also a phenomenon that, on average, people tend to be more empathic towards people who are like them. However, the brain can learn from experience to empathize with people who are different from you (Marco). - Empathy and expanding circles – why is this seen an ultimate truth? Through travels in various culture I I connected with people from all kinds of cultures and sometimes even developing deeper relationships and empathic connections with them than with people I grow up with. - This this phenomenon goes back throughout history. How could Marco Polo travel around the world? This notion that it is a scientific truth creates fear of other cultures. - Empathy teaches you to become fair. If I can put myself in your shoes, then I can see why fairness is so important. That could happen to me to. These two building blocks become the foundations for morality. - Empathy becomes fairness which becomes morality. - We need empathy for fairness and injustice. Be able to read others to know what fair and just is. 44:46 Closing ideas and comments. Karen - Appreciation especially on Rhonda's performing art perspective since it is so different from the academic one. Marco - The great thing is not only talking about this, but also to interact with people from a different back ground. 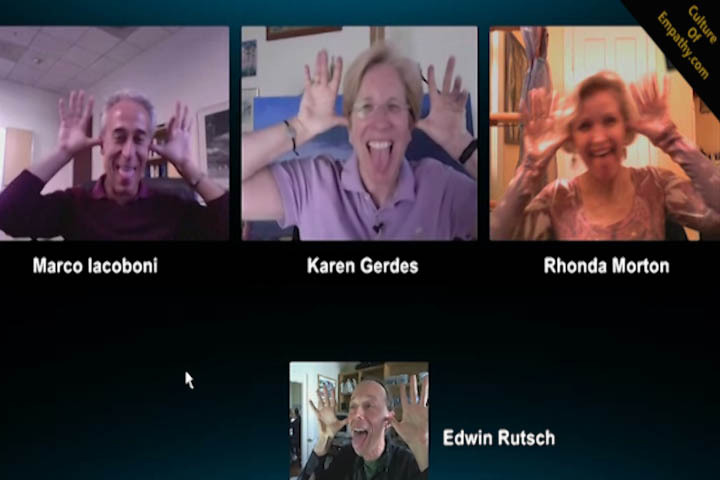 Rhonda - Grateful that there are people out there that can put the science behind what the mystics have always known. - It is hard for people to understand mystical and intuitive things that we cannot see, hold or measure. Thus it is fabulous with the cross- dialogue between scientist and with people like me who just assumed it was true, but did not really have any proofs. I am also so grateful, Edwin, that you are putting us together and that you are doing what you are doing. For gathering the resources on your website and for spreading the word.